Gluten-free Chocolate Peanut Butter Freezer Candy made with five simple ingredients for a delicious and healthy crunchy chocolatey fudge! I have some new FUDGE and candy for us friends! And this isn’t your usual homemade fudge recipe that melts in .5 seconds when you take it out of the freezer. This Gluten-free Chocolate Peanut Butter Freezer Candy has a little crunch to it and no added oil in the whole recipe (crazy, I know). 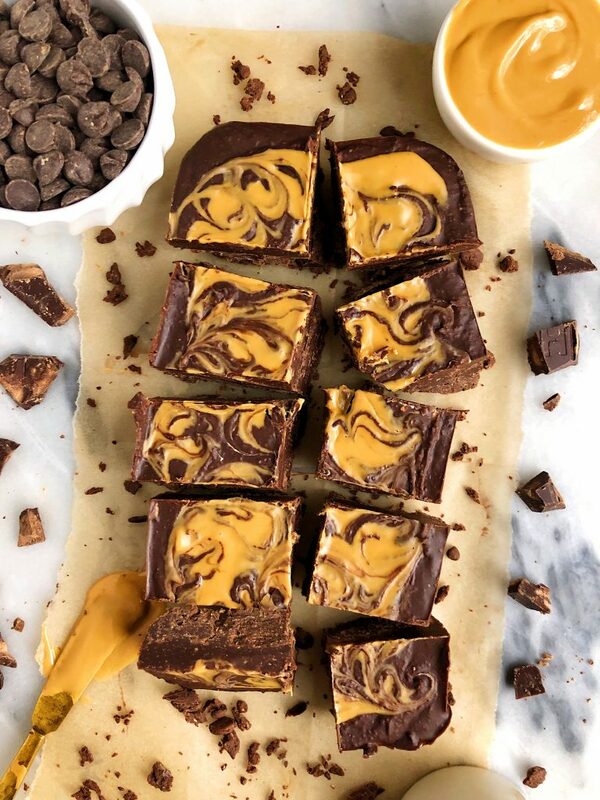 It reminds me of fudge when you take a bite and it melts in your mouth but I like to think of it as a homemade candy recipe with a fudge-y twist to it. 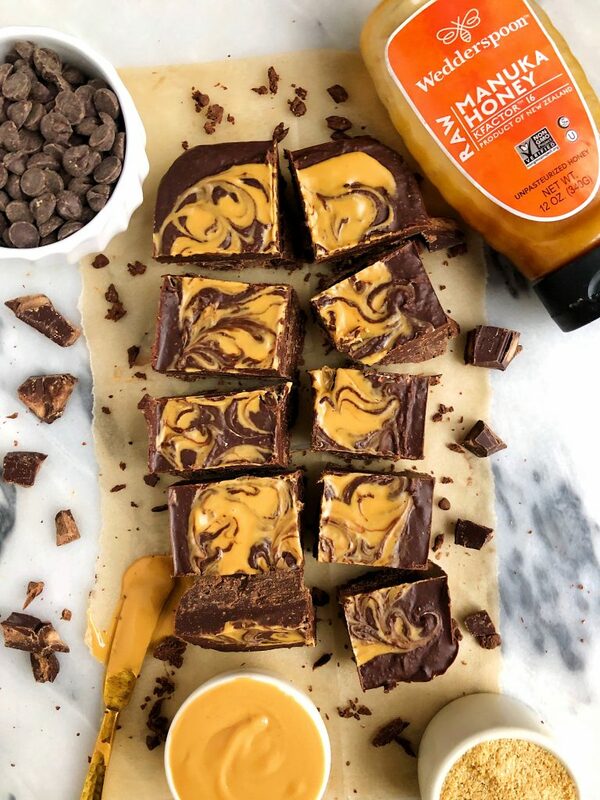 We are using dark chocolate, creamy peanut butter, ground flaxseed and Wedderspoon’s Manuka Honey in this recipe and that is IT (besides the sea salt). 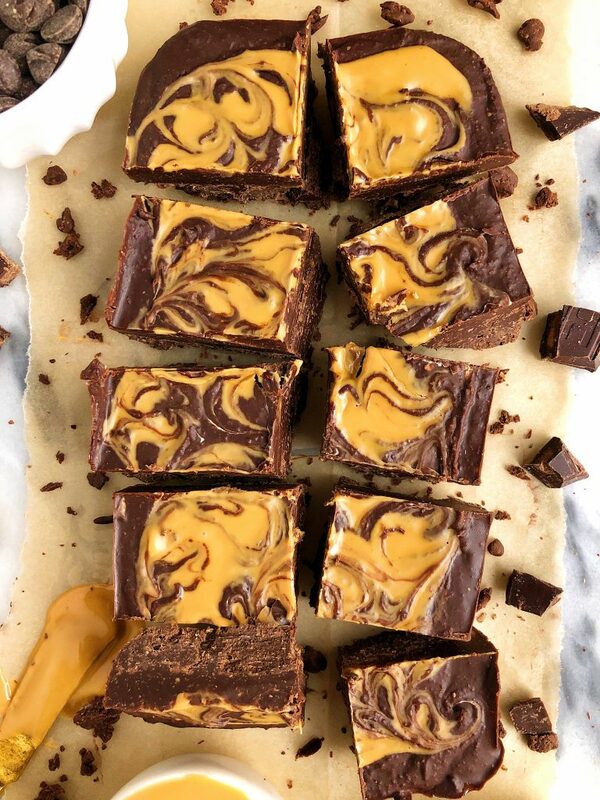 It is truly one of the easiest desserts ever besides going to a store and buying something already made 😉 I love that it combines chocolate and peanut butter and is still relatively lower in sugar. It also stays so well in the freezer so you can stash it there and snack on it as you like. I almost wanted to call this snacking candy but you don’t need me to tell you to snack on this – I know you well enough to assume you know to obviously! I love using Wedderspoon’s Manuka Honey in recipes like this aka no-bake recipes. I add the honey in after I melted the chocolate and peanut butter together then I fold in the flaxseed meal. I add flaxseed to this to thicken it up a bit and also add some extra nutrients. As a mama-to-be, I have heard flaxseeds can help with milk supply (among so many other things for non-pregnant women) so why not? Plus you don’t even taste it – it is such a good addition. I hope you guys enjoy this Gluten-free Chocolate Peanut Butter Freezer Candy as much as I do. Feel free to get creative with it and switch up the nut butter and add in some crunchy cereal or oats or anything you are craving. The possibilities are endless! Thank you Wedderspoon for sponsoring this post. It means so much to me to partner with brands I love and believe in! Sounds delicious!! Could you sub the chocolate for cacao powder? Tell me about this special honey you mentioned? Please, and any good substitute you can suggest?! I’m eating cleaner and healthier and dying for a treat like this, glad I found you! !